PRINTED MUSIC — In preparation for each premiere, consortium partners will receive the printed/bound conductor score, a full set of printed instrumental parts, and electronic delivery of the pdf vocal score; you will be granted permission to copy the vocal score for your rehearsal and performance needs. This printed score & parts rental is offered without charge (cost is limited to shipping). The vocal score (pdf) is delivered electronically. NATIVE AMERICANS — Mr. Davids will personally assist in connecting each presenter with their local Native American communities in whose homeland the premieres will take place. Inviting indigenous people to collaborate is vital to this project’s mission. By joining forces, each premiere hopes to build good relations with, and foster greater insights from, America’s First Nations. We will invite the specific tribal communities to sing in the REQUIEM, and add their own musical and cultural presentations to each performance. Assisting with outreach to tribal communities is offered pro bono; Native American Singers should be offered a reasonable honorarium to present and perform. EDUCATIONAL OUTREACH — Mr. Davids will assist as a clinician and educator for educational and outreach activities in schools and communities, which is highly encouraged. Further, Mr. Davids is happy to assist in fulfilling any outreach or educational grant activities you may secure, for additional income to your organization. Mr. Davids' services are offered pro bono (cost is limited to travel, hotel and per diem). NATIVE AMERICAN FLUTE — Assistance from Mr. Davids as a performer on Native American flute is offered for final rehearsals and premiere performances. Mr. Davids will offer his services pro bono to benefit the success of this project nationwide (cost is limited to travel, hotel and per diem). CONSORTIUM PARTNERS — Before scheduling your premiere, it is important click the “Consortium” tab above, and check the “Scheduled Premieres” link for open performance dates (lower left corner of the map). After choosing your desired date (first-come, first-served), the date of your premiere will be added to the list and your organization will be pinned on the Consortium map. A one-time contribution of $3,000 is requested to become a Collaborative Consortium Partner in this historic opportunity. The contribution helps support the composer’s commission and expenses, and entitles you to the benefits listed above. Each consortium partner will develop its own individual production budget for musician fees, rehearsals, publicity, educational activities, venues and hotel/travel. Each partner is encouraged to take full advantage of all educational, social, and media outreach opportunities surrounding each premiere performance. NON-CONSORTIUM SUPPORTERS — A donation in any amount is welcomed to become a supporter of Requiem For America. Please make your one-time (or recurring) tax-deductible contribution using the Donate button to the left. Thank you for your kind and generous support! AMERICAN INDIANS LIVE NEAR YOU! I am offering my assistance in this regard. Let’s contact the American Indian Nations near you! Let’s walk into the nearby tribal administration offices and ask them to collaborate with us on REQUIEM FOR AMERICA! Let’s share our ambitions and ask them for their kind assistance with our premiere! Let’s invite them to our rehearsals, to sing in our American Indian Chorus, and to perform their own music for the premiere. Let's invite them to our school programs. 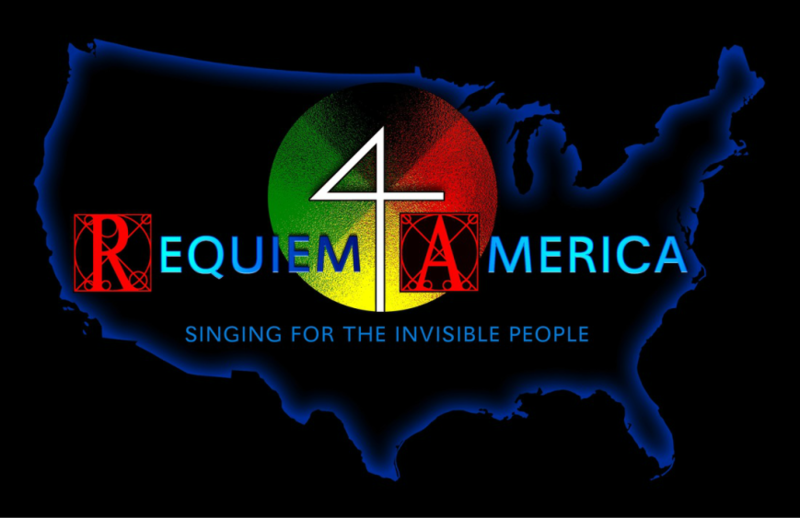 As REQUIEM achieves performances in each state, let’s invite the nearby Indigenous Nations to join us in that effort.